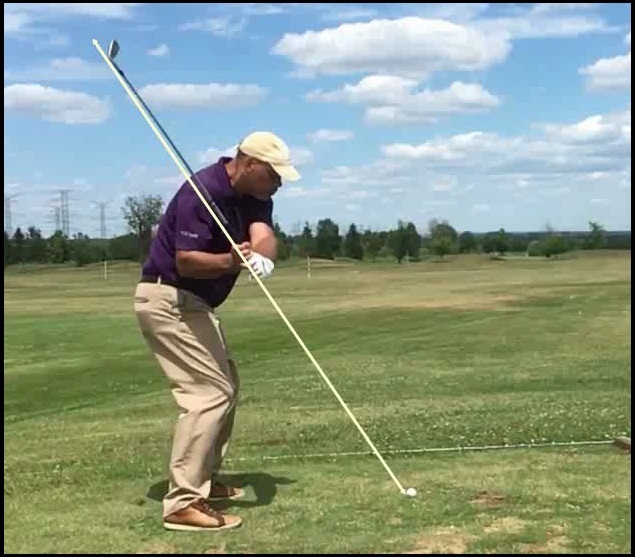 Question – How Did I Get My Swing Plane & Path To Neutral? 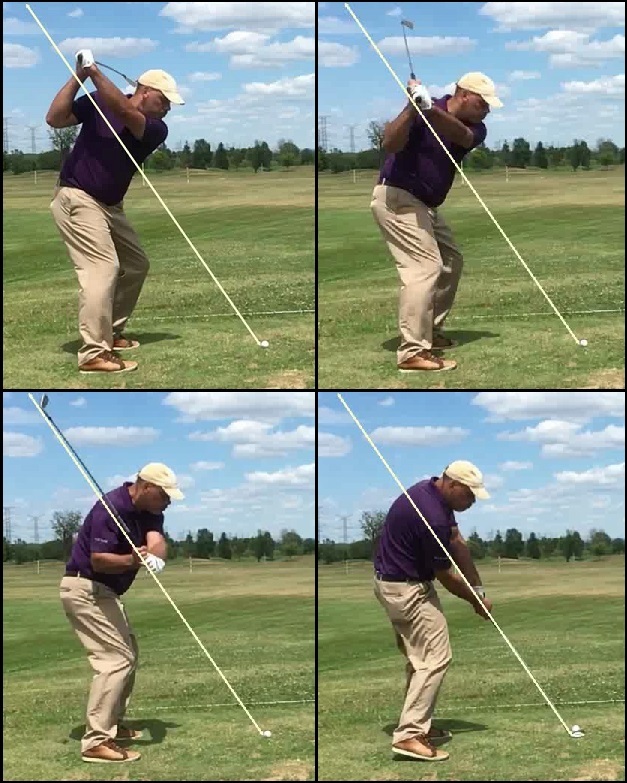 I would say that the things I’ve been showing you over the past few days would illustrate, if there is any such thing, a “neutral” swing plane on the down swing. Over the top would be a club and hands above that plane, making it “steep,” and a “too-flat” plane would consist of having the hands drop below that plane on the way down. You can see that post-impact, the club head and shaft are outside the plane line, which would make that swing fairly neutral with a slight inside-out impact path… makes sense so far? 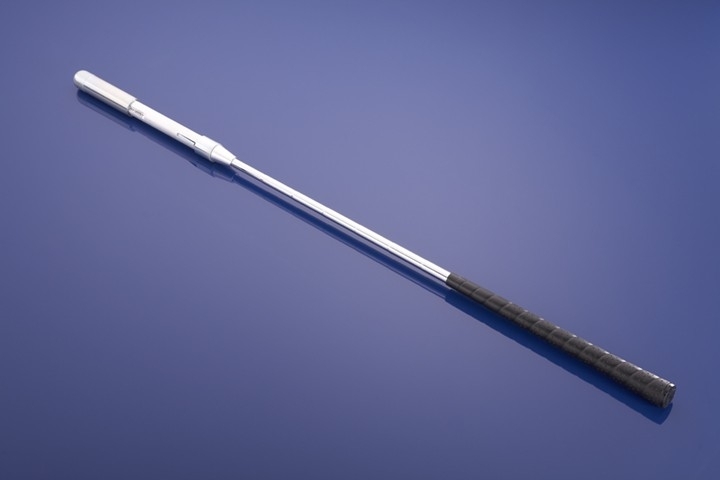 a very low, almost flat trailing heel at impact. But the question remains – how do you swing in a way to get these conditions? The answer is very simple – I have said that we are not machines, as we are made of bone, sinew and muscle, which take the place of rigid machine parts and gears – so we can’t swing perfectly the way a robot does each and every time, but we can certainly create our own “swing machines” using our bodies in the way they are designed to move! 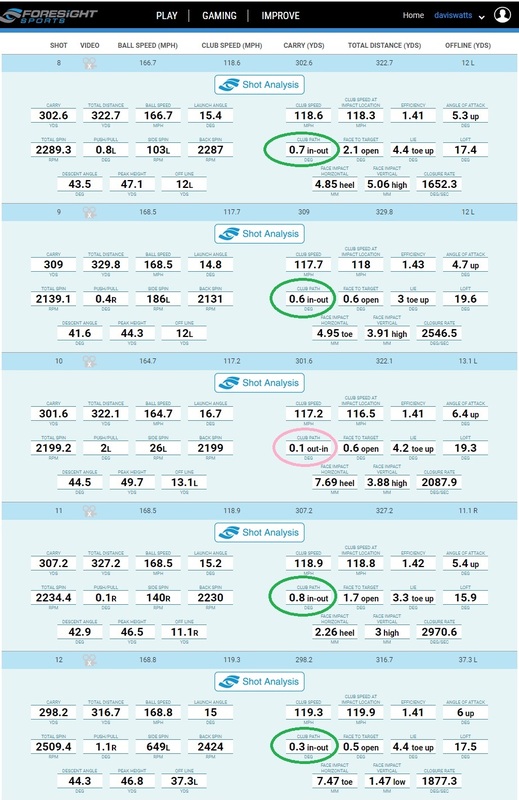 All of these above principles mean that you can build a swing that does what I’m showing above, and in recent posts – and think of the fact that I barely swing anymore these days unless I have numbers to analyze or a swing change to make, so what would someone else be able to do, who can practice and hit balls 3, 4 or 5 days or more per week? We may never be able to have a “perfect” swing like an Iron Byron, but the closer you can get to the optimal model, the better your swing will be. I’m not even where I’d like to be with my swing action, but it’s a process of gradually moving forward as close to the optimal – I know I can get even closer than I was this past summer, and look what it’s done for me so far! 2019 can’t come fast enough for me, my friends. This entry was posted in 5 Iron, Address Procedure, Club Path, E = MCS, MCS Golf Swing, Swing Plane and tagged 5 Iron, Address Procedure, Club Path, DJ Watts, MCS Golf Swing, Swing Plane, WAX Golf on December 18, 2018 by D Watts.